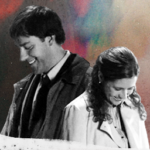 Talk to me, Tivo: Michael strives to keep the staff�s spirits up after learning that the Scranton branch is shutting down; people envision how their lives will change. Jam Cam:Jim doesn�t feel like flirting with Karen this morning, instead opting for the �It�s too hard to explain,� excuse. Because well, does anyone understand Dwight in general? And how much harder is it to understand Future Dwight? Well at least Karen makes it up to him with the good news that the Scranton branch is closing. Jim doesn�t seemed too phased by the news. Let�s hope it�s because he�s in shock and not because he could care less about Pam. Pam, meanwhile, is looking a little weirded out by Michael�s unusual behavior and asks him what�s going on. Michael pretty much lets the cat out of the bag that the branch is screwed. Jim is in Stamford realizing the shut-down was inevitable. He just thought it would be because Michael sold the building for magic beans. In Scranton, Michael decides to save the office by going on a trip to New York. �Oh good, you�re bringing Dwight,� Pam says sarcastically. She should really start looking for a new job and hopefully one near Jim. Well, one can hope. Jan talks to corporate and they decide to shut down Stamford instead. The good news is that Scranton is going to stay open and she offers Jim the same promotion there. Yeah! But wait, Jim isn�t sure about going back because of some unpleasant personal stuff he left behind. Like having his heart broken by Pam. Dammit, Jim! Go back anyway! She can�t win you back if you�re not there. Somehow, Jan quickly gets back to Scranton to tell them that nope, they are staying open after all. Now Pam is the one that is inquisitive about who is coming over from Stamford, or rather who is coming back judging by her Freudian Slip to Jan. Pam, are you letting your true feelings out? Ryan seems just as interested in whether Jim is coming back as Pam. Apparently, he thinks things are going to be awkward. Pam gets worried he knows about Jam until Ryan explains that he hopes Jim doesn�t hold it against that he took Jim�s old job and Jim�s old desk. Pam�s secret is safe for another day. Pam better be careful though because Karen is flirting with Jim in Stamford while asking him what he�s going to do. Karen thinks she�s going to head to Scranton and Jim tries to talk her out of it, but not very convincingly. Stupid Jim � don�t give her hope! On the other hand, Pam starts to get excited when Phyllis tells her she thinks Jim is coming back, but is cut off before explaining how she knows this. Pam is looking a little shocked by the news, but Phyllis says she�ll tell us later…I mean, Pam later. Oh c�mon, Phyllis, give us something! And crap, it�s Roy. He just wants Pam to know he�s glad she�s not leaving her dead-end crappy receptionist job. Get over it, Roy. You don�t know what you got til it�s gone, and Pam is gone. But while Pam talks about how finding another job is a pain, we see a shot of Jim looking like he�s in pain. He really did get his heart broken and he really is thinking long and hard about going back. Pam is sorry, Jim. She really is. You have to go back and give her a chance. Oh wait! He is going back! SQUEE!!!!!! Yeah Jim. Jim confirms it to Karen, he�s going to take that job in Scranton so she could move to Scranton if she�s offered a position there. What?!?! No Jim, that�s not what you were supposed to say. Ugh. Karen is happy he said that because while she doesn�t think our Jim is into her, she�s into Jim. Wha? No seriously, shut up! Don�t go to Scranton then. There is someone in Scranton that is perfect for Jim and if you get in the way, we will hurt you. Karen is going to Scranton, isn�t she? Ugh again. The Others: Michael gets the bad news from Jan that the board voted to close the Scranton branch so he heads to the CFO�s house to change his mind while the office workers start thinking about what to do next. In Stamford, Josh decided not to take the new Dunder Mifflin position, which throws all the plans off and leads to the closure of that branch instead. Scranton stays open despite the fact that Michael and Dwight never get a chance to state their case before the CFO and yet can�t figure out how they did it. What have we learned today, kids: Sometimes absence makes the heart grow fonder, but you won�t know unless you take that new job. Jim: I know it�s not definite or whatever, but do you know who�s coming over from Scranton? Josh: I honestly don�t. I don�t know. Jim: So is it like sales or accountants or…? Josh: You know what, Jim? I wouldn�t worry about it. Jim: No. No, just some…personal stuff and I�m not really ready to revisit that, I don�t think. Pam: Jan, do you know is anyone coming back to Scranton? Pam: Coming to Scranton? Is anyone coming to Scranton? Ryan: Is Jim coming back? Pam: That�s…um…I haven�t thought about it. I don�t know. Huh. Pam: Yea, that might be weird. Phyllis: Hey, I hear Jim�s coming back. Pam: Where�d you hear that? Pam: Maybe this is good. Finding another job is a pain, there�s another annoying boss, another desk, I�d have to learn everything all over again. So…there are reasons to stay.